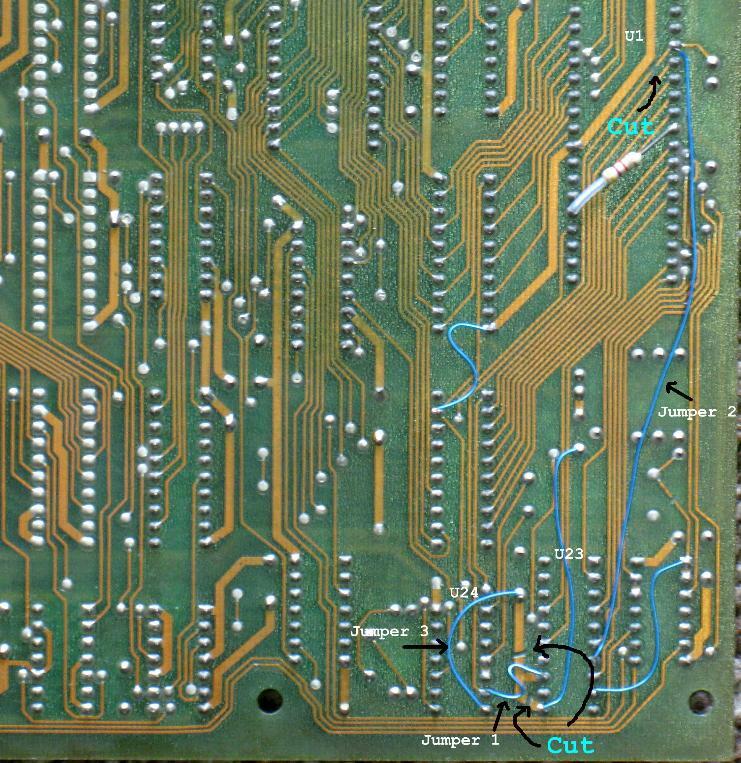 Early versions of the Dragon's Lair main board were a work in progress. Multiple changes were made during production until approximately serial number 5000, when the design was essentially finalized. The purpose of this report is to document each change, along with its purpose. 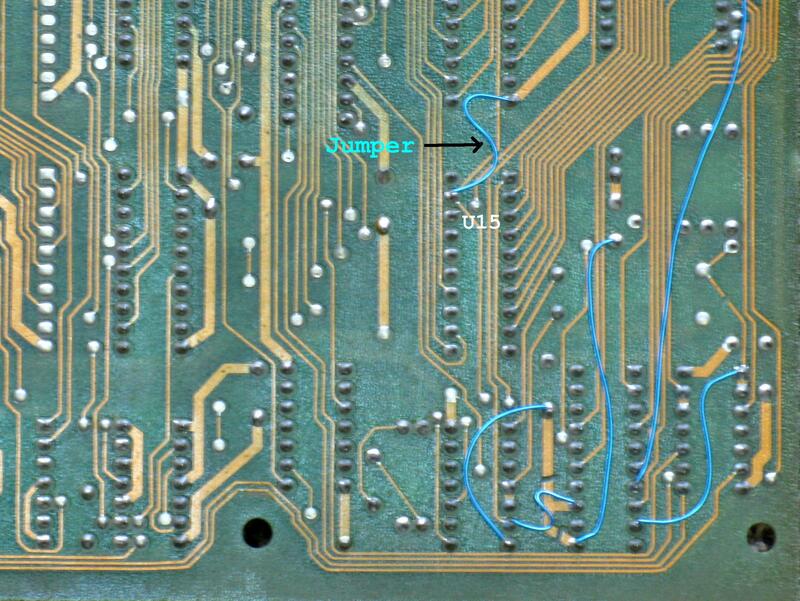 If you have a Revision-A boardset, you should use this document to determine if your board needs any further updates, and if so, make the needed change and thus, bring it to its most stable condition. Please note that these updates are not absolutely required. If your board is in a working game, then there is no need to mess with it. However, if your game has a tendency fail at power-up, and often needs to be restarted, then these updates should be performed. These revisions can also be found on page one of the DL schematics, where they are described in chronological order. 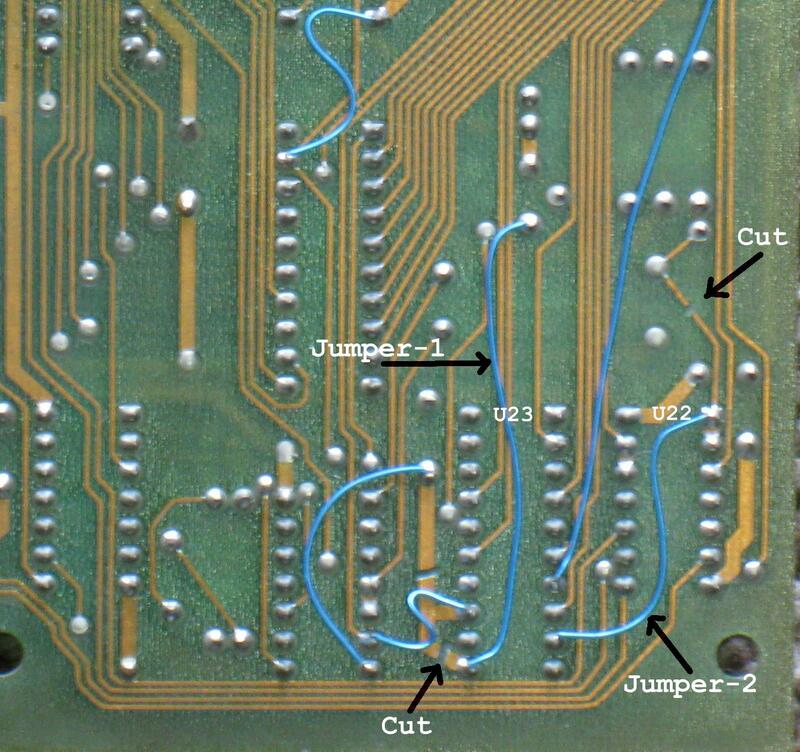 I, however, will be describing the changes according to the area of circuitry to which they apply. Remove your board from the machine and then remove it from the mounting plate. 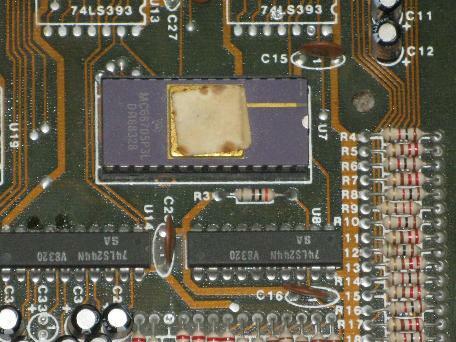 Remove the ROM board. Read each section below, and compare the photos to your board. Determine if any individual modification has already been done. If so, skip to the next mod. Chances are that you will only find one or two modifications that need to be performed. This is the easiest one. Resistor R3 must be 300 ohm. It was changed from 1K ohm. You will find R3 set between U7 and U8. The color code for 300 ohm is: Orange, Black, Brown, Gold. The color code for 1K is: Brown, Black, Red, Gold. Here is a picture of R3 with the proper 300 ohm resistor. If you have a 1K resistor, change it to a 300 ohm. The 4Mhz clock signal was a never-ending problem for Cinematronics. 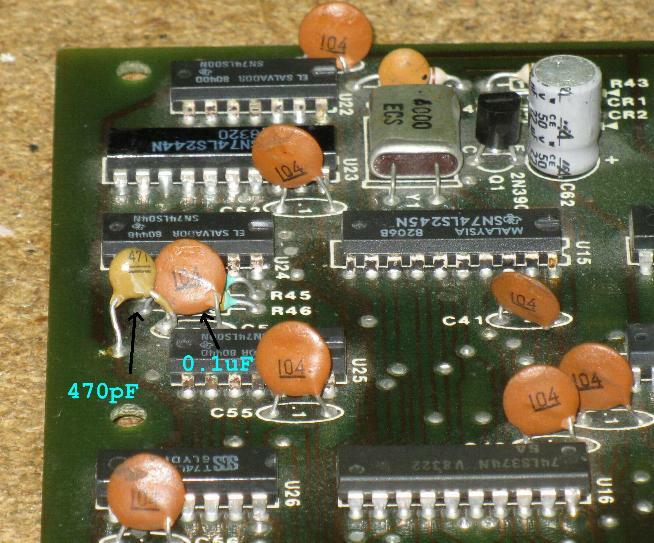 They added signal buffers and changed the capacitors multiple times. For the Rev-C board, they changed it once again. 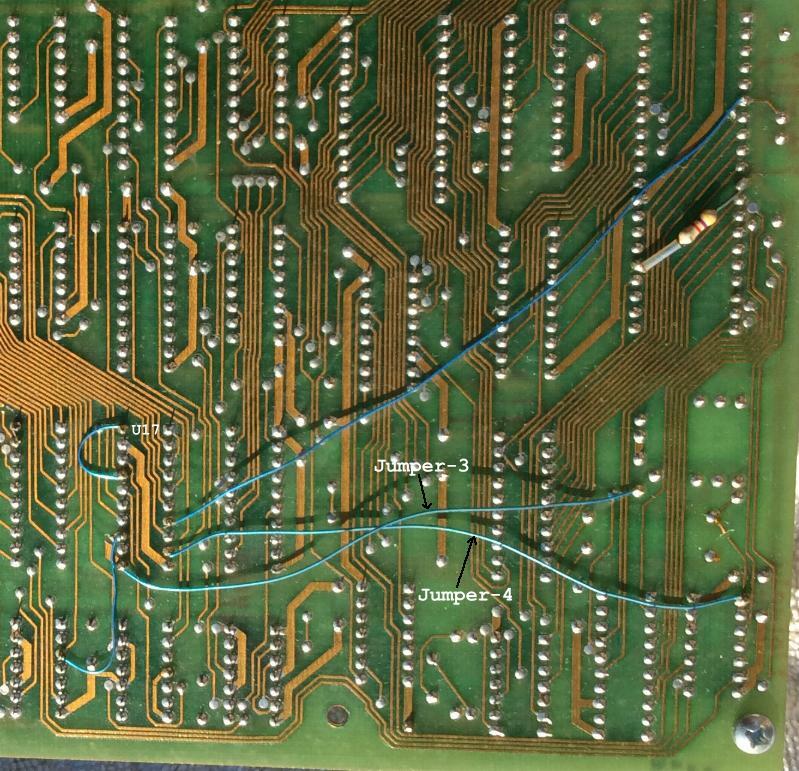 I have a very rare Revision-2 board (a prototype for the next lasergame, which sadly never happened) showing that it was completely redesigned once again. For this mod, we will be updating to the final version used in the last Rev-A boards. 2.1: Capacitors C54 and C63. C54 should be 0.1uF - look for "104" on the disc. C63 should be 470pF - look for "471" on the disc - note that C63 has no official location. It is a new addition to the board and is soldered to one leg of C54 and ground. 2.2: Add a buffer / booster to the 4Mhz signal. There are two methods for performing this modification. Earlier boards use a buffer on U17, while later boards use a buffer on U23. Check to see if your board has U17 installed; if so, examine the next picture. 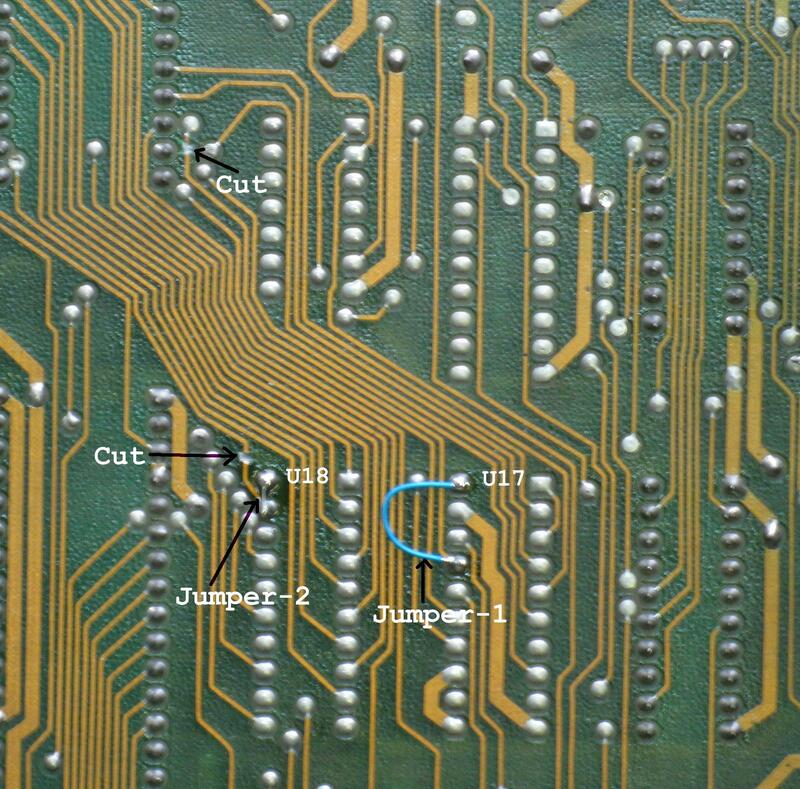 If jumpers 1 and 2 are present, then the modification is complete. Skip to Modification-3. If you do not have U17 installed, or the modification is not done, use method 2: U23. 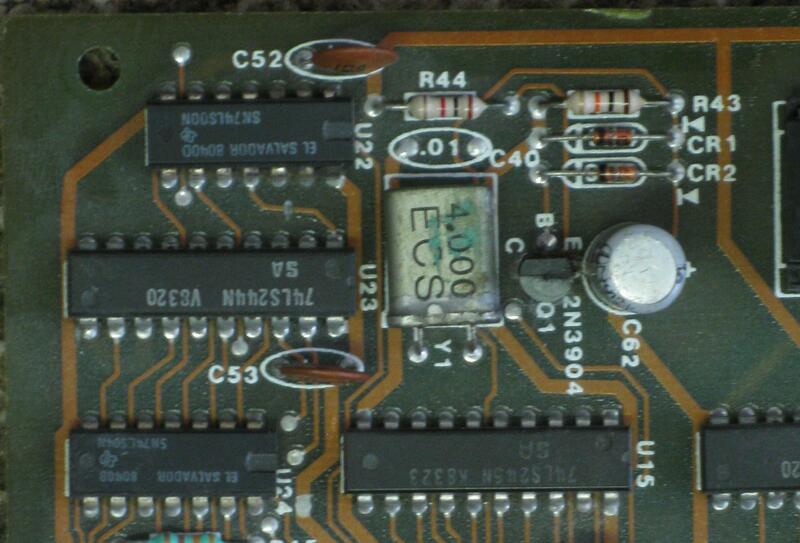 Capacitor C40 is located just above the 4Mhz Crystal. If it is present, remove it. Remove and replace the electrolytic capacitor C62 (22uF at 16 volts or higher). This is not a modification, but it should be done. 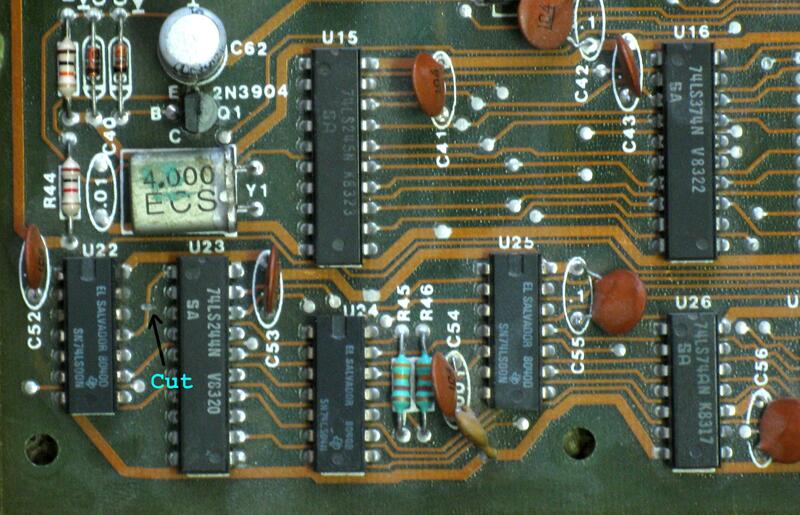 C62 controls the duration of the reset pulse, and after 30+ years, it's important to replace it. Again, for this modification, there are two methods. Earlier boards use a buffer on U17, while later boards use a buffer on U23. 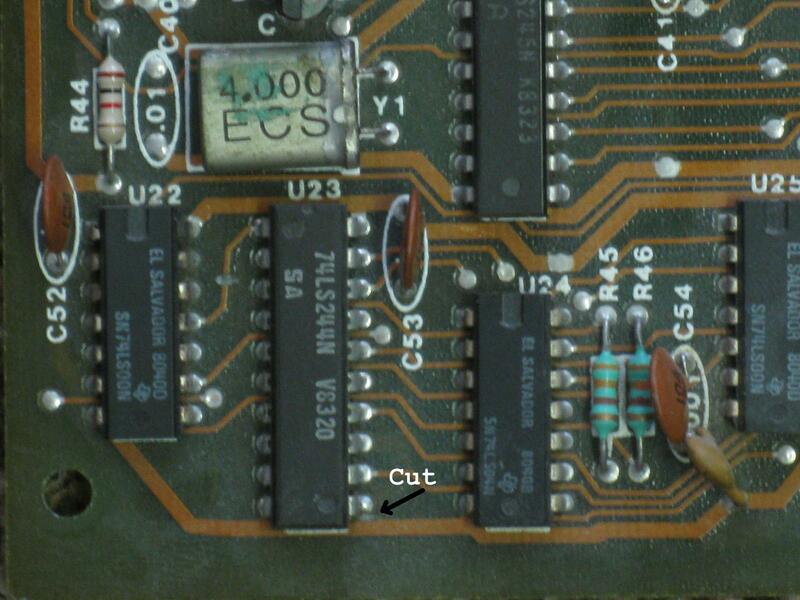 Cut the small bit of trace connecting U23:pin-11 to ground. 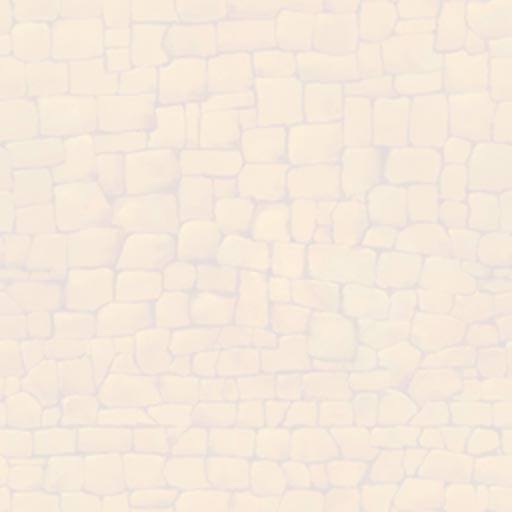 Make two cuts as shown in the next picture. Isolate U16:pin-1 by making cuts on either side as shown in the next picture. Add a jumper to re-make the ground line on either side of the cuts. 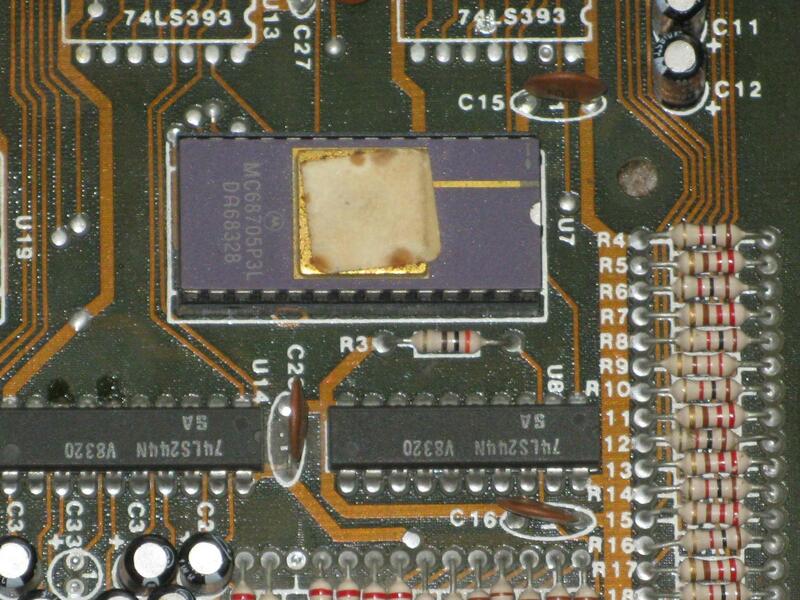 The original design for the Dragon's Lair boardset included a second processing device (U7). 1. It would provide the "Real Time Clock" needed to keep the game in sync with the laserdisc video. 2. It would act as a security device by monitoring the ROM code and board activity. 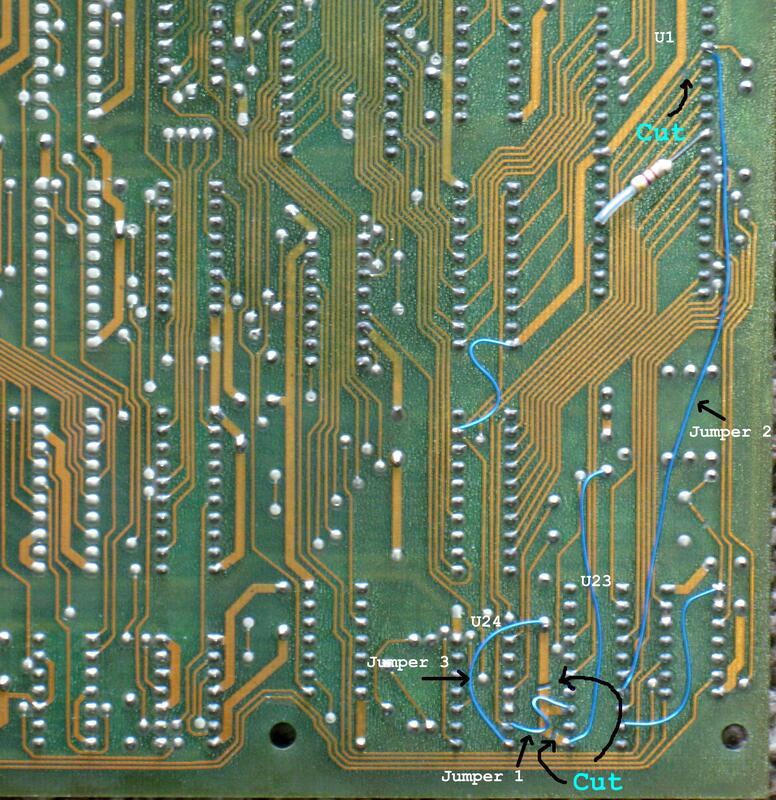 If anything failed to pass the security inspection, the chip would not produce the RTC signal, and the game would not run. However, the security features of the chip were never actually put to use in production machines. The purpose of these modifications is to disable or remove the address and data bus control signals from the unused processor. Cut the trace as shown in the next picture. 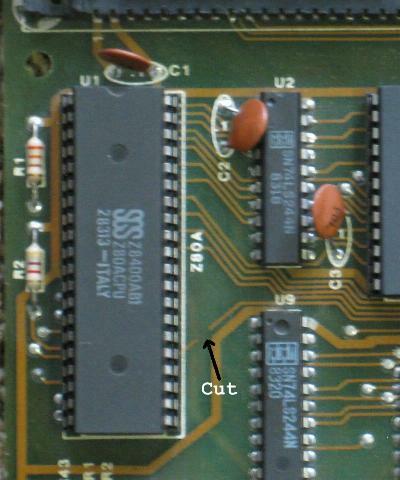 Cut the two traces at the locations shown in the next picture. Cut the trace between U22 and U23 as shown in the next picture. 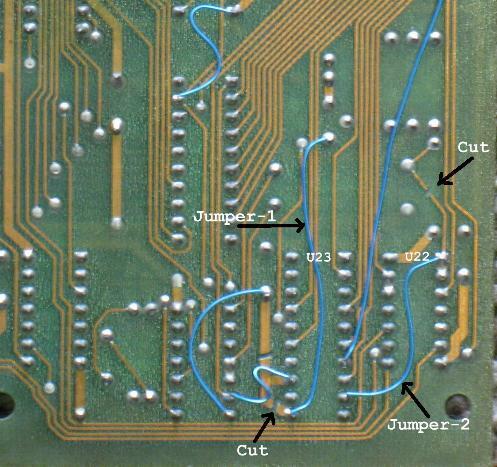 Add a jumper from U15:pin-19 to ground as shown in the next picture. The Revision-A board is designed to operate the Pioneer PR-7820 laserdisc player, which was the first player model to be used in Dragon's Lair. Later machines came with the Pioneer LD-V1000 laserdisc player and a Revision-C board to operate it. The Revision-A board must be modified to operate with the LD-V1000 player. HOWEVER... In our modern time (2017 at the time of this writing), the Pioneer LD-V1000 is rarely used. Most Dragon's Lair and Space Ace machines now use some form of replacement player. Common examples are the Dexter player, LaserCon Merlin, Hi-Tech and LaserAce converters. These newer players and converters work perfectly with the Revision-A board running in PR-7820 mode. So, I recommend that you do not do the LD-V1000 modification. If you do have a working Pioneer LD-V1000 player, and it is your intention to use a Revision-A board with it, here is a link to the procedure. 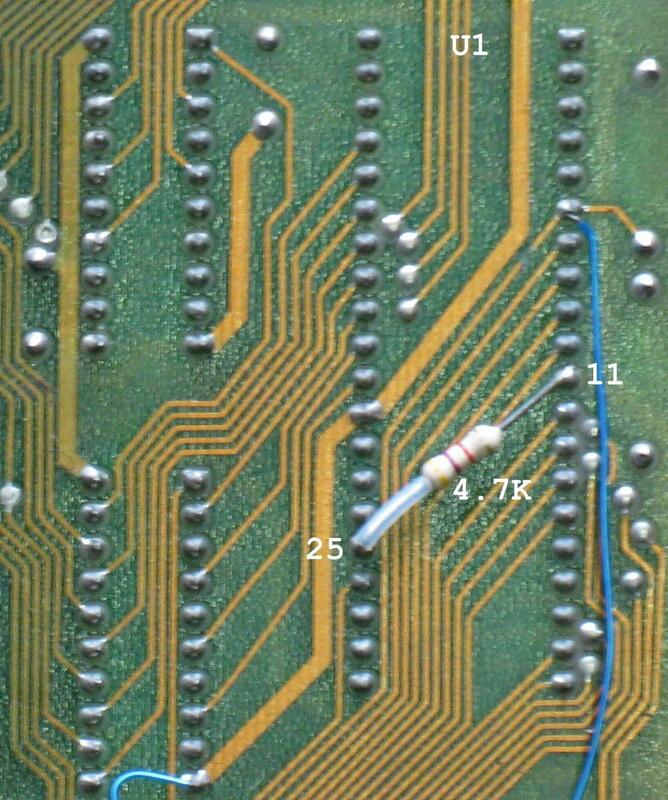 The U7 chip (MC68705P5) is used to produce the Real Time Clock (RTC) signal which keeps the game board in sync with the laserdisc video. 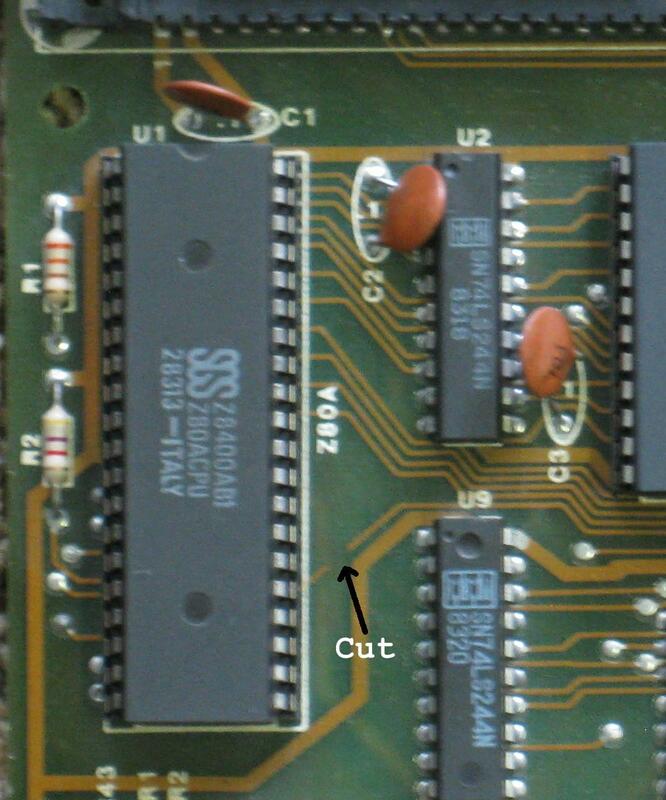 This chip has to be programmed before it can be used in the game system, and since the programming has been lost to time, a failed U7 cannot be replaced. If your Dragon's Lair board fails to boot up. Check the RTC signal at U7:pin-12. You should see a square wave at approximately 32Hz. 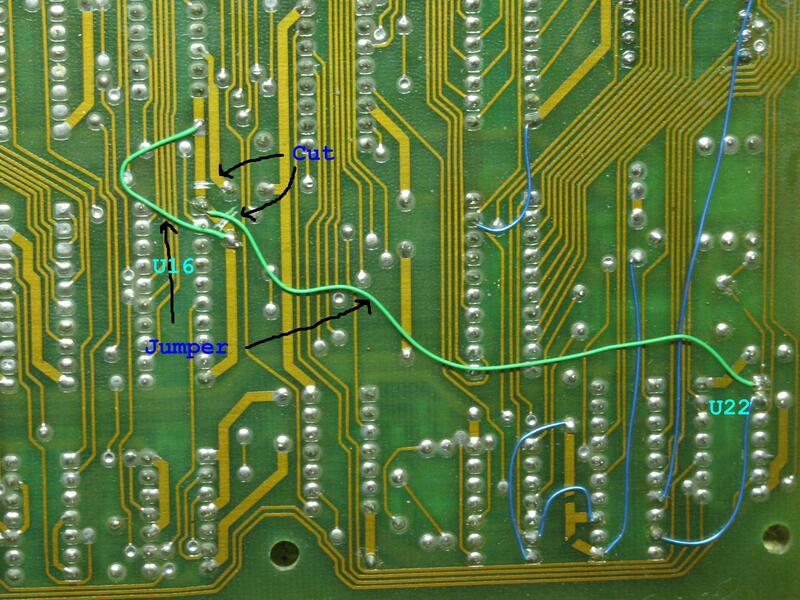 If you have no RTC signal, or your U7 is missing, then perform the U7 Bypass Modification at this link. Of course, if your U7 is missing, this modification may have already been done. Not a modification, just good policy. 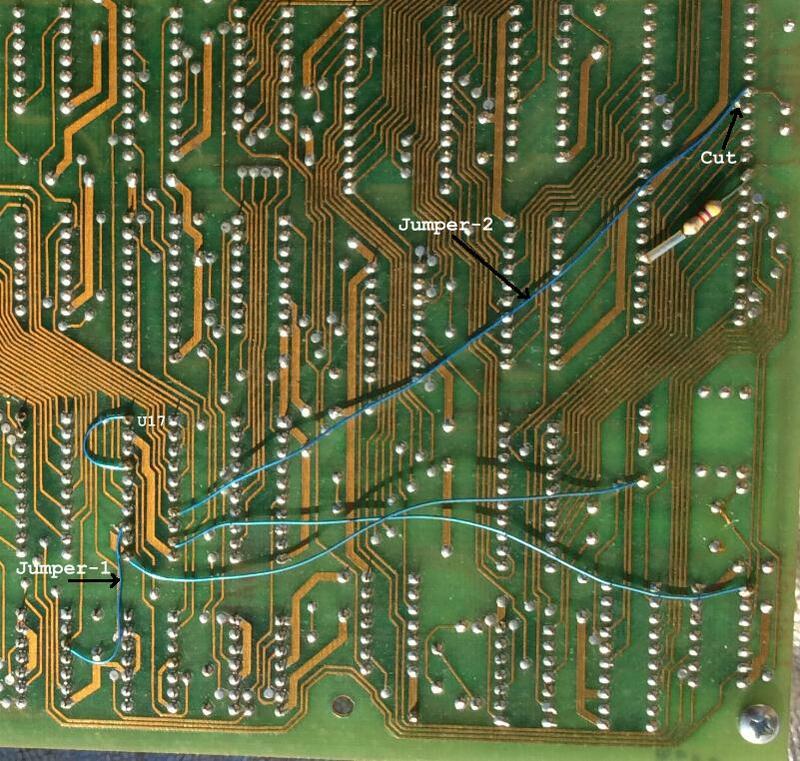 The large capacitors surrounding the harness connector are part of the audio amplifier circuits. If the ones on your board are original, then they should be replaced. When they get old, they cause noise on the audio, and they cause the amplifier chips (U29 and U30) to run hot, which burns them out. You will need eight 470uF at 50 Volts with 0.2" lead spacing (replace C36 with one of the 470uF caps) and two 22uF caps at 50 Volts and 0.1" lead spacing (for C51 and C62). I've never found it necessary to replace the 14 or so 0.1uF caps, but you can if you want to. Again, not a modification, just good policy. You may want to replace the cheap single-wipe chip sockets with new quality dual-wipe sockets. U1 and U19 are 40 pin sockets. 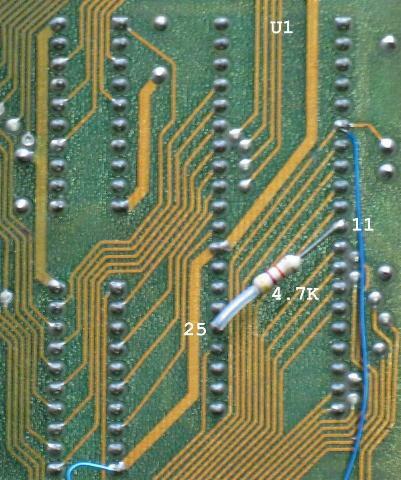 J1 (player interface connector) and U3 (RAM, if socketed) use 24 pin sockets. The notes above are believed to be correct and work fine for the author. No one is forcing you to do this. If you break your Dragon's Lair or Space Ace PCB, it's your fault!